The diversity of industries represented in the University of Zurich’s Executive MBA programme says a lot about the character of the alumni organisation. It is a dynamic network connecting members with a large and growing resource of diverse expertise. As an Executive MBA graduate, you can become a member of the University of Zurich Executive MBA alumni organisation. Membership in the alumni organisation also provides you with access to the alumni organisation of the Faculty of Business, Economics and Informatics as well as the University of Zurich’s alumni umbrella organisation. 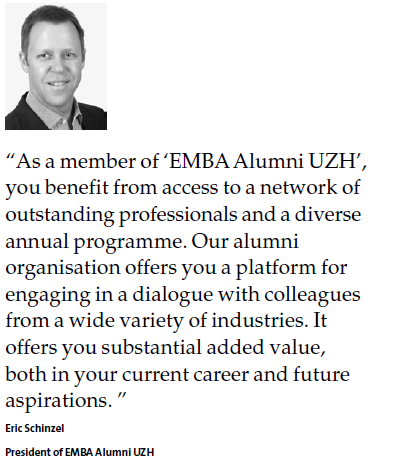 The goal of “EMBA Alumni UZH” is to maintain and promote personal contact. At the same time, we also meet the broad thematic interests of our members by offering talks and panel discussions on current economic, social and political topics as well as tours of companies. We help our members keep their knowledge up to date through training and development events. If you have questions you would like to discuss from the perspective of a former participant, the Alumni Office would be pleased to put you in touch with a graduate of the programme. Members of UZH Alumni as well as the affiliated member organizations can enjoy numerous offers and discounts - for almost every situation in life.